Code quality management is an topic that has seen a tremendous increase of attention and demand. The increasing awareness of Technical Debt issues at all levels of the IT landscape is one of the factors at play, as well as increasing adoption of Agile techniques. Perhaps most importantly, most developers at a personal level want to develop better code, and are looking for ways to improve their output on a continual basis. CAST has a long history of improving code quality for IT enterprises. CAST has worked in the code quality sphere for the last 12 years. Our experts have written multiple scientific articles, and even several books on this subject. Most importantly, our industry-pioneering products ship with hundreds of engineering rules taken from industry sources, representing the most important code quality checks for developers to follow. Code quality checks are becoming increasingly available at the developer workstation, built into the IDE. We believe this is very good for the industry, but the IDE-level tools need to be deployed in a way that works well for the enterprise. Many Agile enthusiasts may say that code should never be checked in with code quality violations, but in practice we see development teams struggle to achieve such purity. At CAST we propose a code quality management methodology that separates the quality checks that should truly be examined at the IDE – to ensure basic code hygiene – from those checks that are more relevant taken in the context of the system. This leads to the application quality discussion. Most software analysis experts would agree that the more context you have about the code, the better your likelihood of flagging a true problem, or avoiding to flag something that’s not really a problem. Many code quality problems flagged at the IDE actually turn out to be false positives. Similarly, there are many serious issues that you cannot detect at the IDE. An individual program may exhibit terrific code quality, but still cause serious problems in its interaction with the overall system. CAST proposes a code quality management methodology that takes quality issues at the application level. We call it Application Quality. By looking across code components, across files, across tiers in an application and across technologies, you can analyze a code component in its system-level context. This provides you the ability to interpret the results in a much more accurate way. It removes the noise of false positives and prioritizes the truly risky code quality issues to be seen as front-and-center. Many developers we speak to have tired of their code checkers – we propose a way to show them only the flaws that really count. 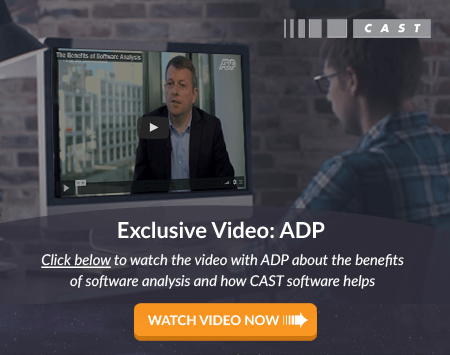 CAST’s robust technology–the Application Intelligence Platform (AIP)–assesses even the most complex of business applications in a holistic manner and enhances every aspect from design to execution. Whether you are building from scratch or enhancing legacy applications, CAST AIP gives you access to continual, automated assessment and ensures that quality is built into your systems with every developer contribution.